St Barts shams come in aqua, mix, storm and ink colors. 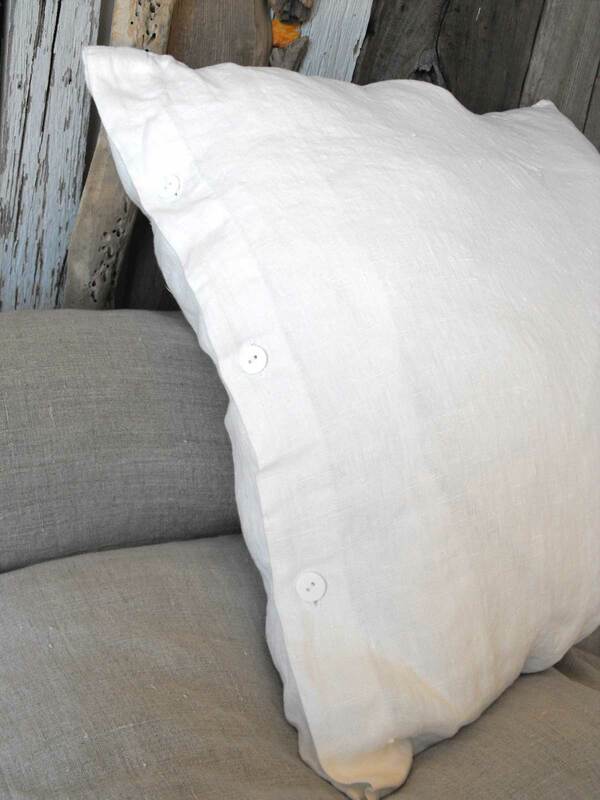 You have a choice of perfectly plain two-hole buttons in white or the subtle natural texture of coconut. There is an invisible zipper option for minimalists. Ink comes with zippers only. Price per single sham. Shams are best 2” smaller than their infill, so they look plump and full (watch my video Choosing Infills). Pillowslips on the other hand are loose, for comfort. square 24" x 24" (note: Our square shams are 2" smaller than a standard euro size because we like them to fit snug - it looks neater and gives more support for leaning up against). These are great pillowcases to have in case you have a "warmer-than-usual" sleeper, whose head tends to sweat at night. The natural linen shows the stain of sweat, but these almost-black beauties hide it all and look great with the natural linen shams and white duvet. I am very pleased to have found these products. The color and finish is great and I will definitely purchase more. Thanks. St Barts Shams on my new big, soft gel fiber pillows have enhanced my bedtime reading so much. The peaceful blue is soothing while the texture is perfect for a warm summer's night. They even seem to help my pillows stay cooler. My summertime bed is so lavish now with my St Barts summer cover in the same gorgeous blue. I am, as always, thrilled with my purchase.